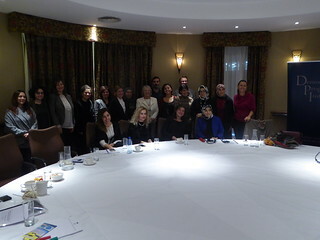 In December, DPI delivered a Comparative Study Visit to Ireland for women participants. The Comparative Study Visit cohort of 16 included MPs from different parties, journalists, academics and peace activists as well as women working in think-tanks and cultural heritage. This wide range of occupations encouraged a variety of perspectives on the experience and allowed the participants to engage with multiple angles of the Northern Irish peace process. The six-day agenda was heavily packed and included stays in both Dublin and Belfast. In Dublin, the participants enjoyed a Roundtable discussion with Dr David Mitchell, an Assistant Professor in Conflict Resolution and Reconciliation at Trinity College who has written extensively on the Northern Irish peace process. Following this, the Conflict Resolution department of the Irish Department of Foreign Affairs and Trade hosted a Roundtable on their National Action Plan on UNSCR 1325, before providing a guided tour of Dáil Éireann, the Irish parliament. The last major event in Dublin was a Roundtable with parliamentarians of the Joint Committee on Justice, Defence, Equality and Women’s Rights.